Almost every chicken coop begins with a story. Ours started when we went over to an old friend's house in the summer of 2009. The sounds of hens filled the air and my wife rushed to the friend's coop with glee. "We can do this!" she said. We sampled a dozen eggs from my friend's flock and the planning and research went from there. We scoured many ideas on BYC but they had to fit in our skill set. I had not built anything in my life so I started at square one with knowledge and buying tools. For construction knowledge I bought Carpentry and Construction (4th edition) by Miller, Miller, and Baker used off of Amazon. I also recalled the wisdom of a carpenter who remodeled our house several years ago, who said carpentry is all about "plumb, level and square." The building began in March 2010 and was completed in August. 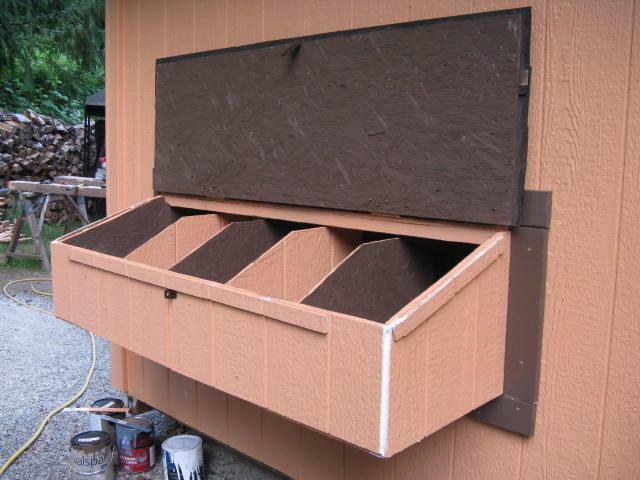 The basic premises of our coop were to have 1) sufficient indoor square footage (floor space), 2) sufficient nest box area, and 3) the building had to be built to withstand snow, high winds, last a long time, and require little upkeep beyond the basics of painting and normal cleaning. We live with winged and four-legged predators so security was also high on our list. I also despise rats and mice so (safe) pest exclusion was planned for. 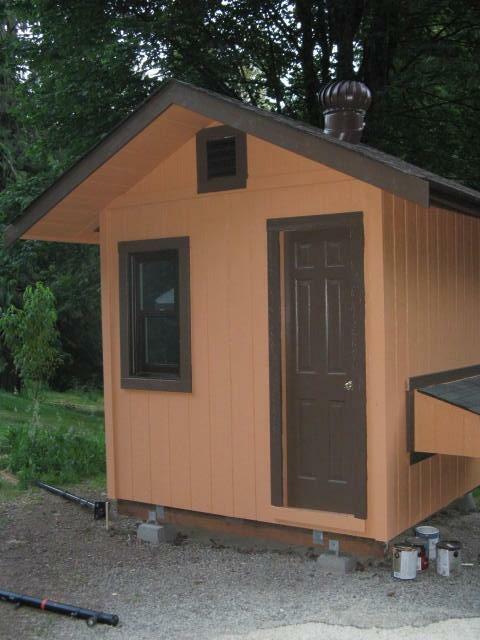 The coop is an 8 foot by 8 foot square with a gable roof, for roughly 64 square feet of floor space. The nest boxes are situated so we can open the top and recover the eggs from the outside of the coop. In order to achieve building quality/longevity and the other goals of lots of living/nesting space for the chickens we had to pay attention to detail in all aspects of the construction process. We utilized 2nd hand, left over and on hand materials when practicable but we bought the vast majority of materials from two local lumber sources. If you choose to use new lumber/building materials, I strongly suggest buying in January/February before seasonal market forces drive up prices. We bought our lumber in February and saved big. Craigslist is a (hit and miss) source for materials too. So far we've experienced: 1) happy and productive chickens 2) We have a worry free coop 3) Friends and neighbors giving us endless compliments about the coop and some dubbing it the "Chicken Castle". A neighbor's daughter, who's farm experience includes raising her own chickens and showing pygmy goats at the state fair, called our coop "flawless." Here is a photo journey through the construction process. 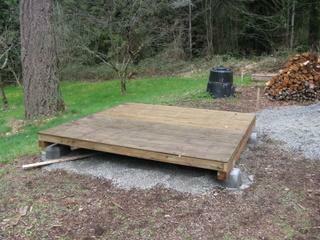 Above is the floor frame and "foundation". 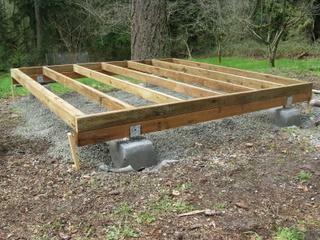 Pier blocks with pressure treated 4x4's hold up the floor frame of pressure treated 2x4s. Under each pier block I dug a 2 foot deep hole and back filled it with compacted gravel. Making these all level required patience. Next I nailed down two sheets of pressure treated plywood. I crown stapled two layers of 1/4 inch hardware cloth over the gap between the plywood sheets for rodent exclusion. The walls went up next. In this photo two top plates, window and man door framing are all that are left to install. The walls are full size (88 5/8") for a reason. During our research we had conked our skulls into too many low hanging coop roofs. We decided our journeys into the coop would not require us to stoop down to avoid a concussion. 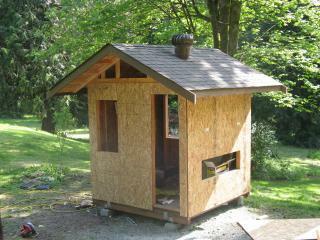 I nailed down two sheets of OSB perpendicular to the pressure treated plywood. For the walls we had a mix of new and old lumber. I used three full size 4x4s left behind by the former homeowner and a new one to form the four corner posts. New 2x4s at 16" on center (O.C.) were put up the rest of the way. 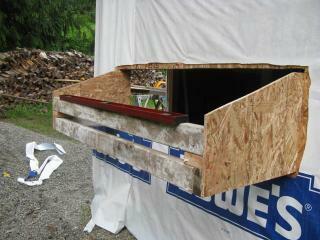 Headers for the windows, man door, and nest boxes are a mix of reclaimed 4x4s or 2x6s. 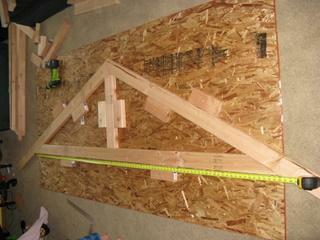 This was a "rainy day" construction day in my living room with a truss template I ginned up. I decided from day one to do trusses over a rafter system. 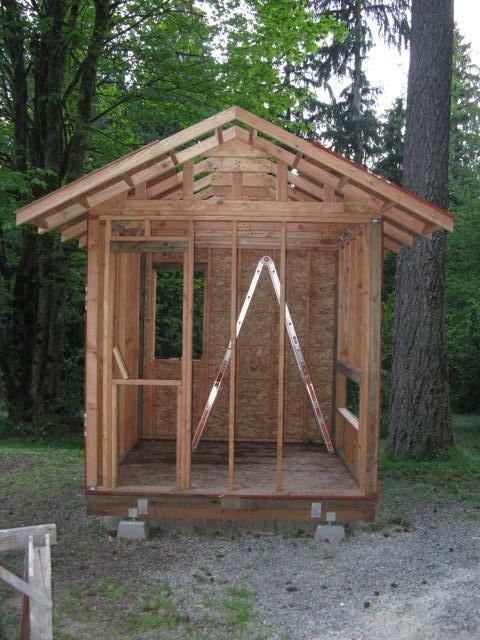 The down side of trusses was the recommendation to only get professionally made trusses. This "king post" truss was the simpliest looking design so I decided to take a shot at making them myself. 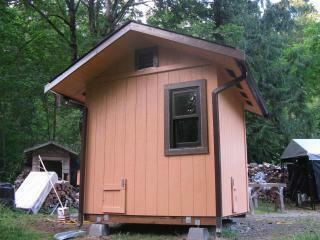 I made three like this one and two "gable end" trusses. I used plywood, left over ring shank joist nails from an old remodel, and VERY strong wood glue for gussets. Making the trusses was very time-consuming but well worth it for the peace of mind from their strength. Roughly two months into the process and the roof, fascia, vent stack, soffit vents (not visible) and solar tube (other side of roof) are in. This was the one phase where I sought outside professional help from a roofer we've hired before. He came back later to put roofing on the nest box. Scrap OSB cut to fit and old 2x4s make up the nest box. 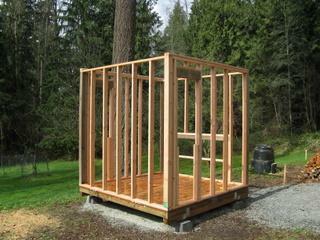 An inside view of the coop showing the framing, 1" foam insulation, a window and a finished wall. For some reason this photo makes it seem like the bottom corner of the finished wall is way out of plumb. Everything is straight. 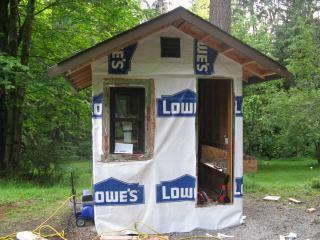 For the inside walls we bought 2'x4' sized T1-11 siding from the lumber yard down the road for $.99 a piece. Four of these was worth a full 4x8 sheet of plywood or OSB for wall coverage and the scraps proved useful for window framing and baseboard floor trim. For the exterior siding we used full sheets of T1-11. They are heavy and ungainly to work with. I nailed blocks of scrap to the foundation to keep them in place for nailing. We're almost done! 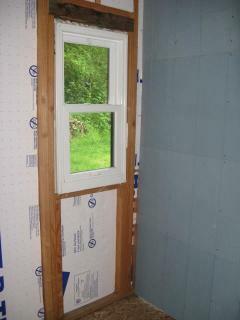 Trim is installed and painted around the windows, nest box, door and wall corners. For the trim I used 5/4 4" wide cedar decking. It was inexpensive and easy to work with. After nailing it down the trim was caulked. The door was also bought at Habitat for Humanity for next to nothing but if I could do it all over I would have spent the $$ and bought a prehung door. It was a royal pain to mortise for the hinges, hang the door and ensure a good fit and finish. The reclaimed vinyl windows also did not come with screens (much needed in the heat of the summer) and we had to order these. Note the roofing installed on the nest box on the right. At the top you can see the gable and soffit framing is enclosed by the 2'x4' T1-11 material cut to fit. 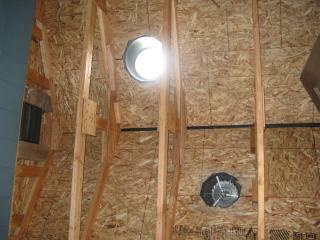 Soffit vents (see below) provide airflow. Gutters and downspouts to splash blocks are done. 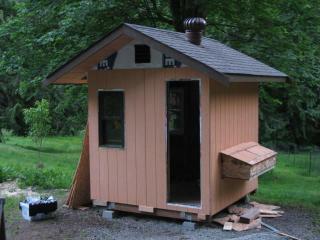 The small door on the bottom left was the planned "poop" door to allow for shavings to be easily swept out. My wife has decided this will be a door to a second fenced run. The door to the run is just visible on the lower right outside wall. 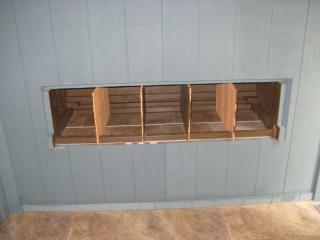 Here is the nest box during final trim and caulking work. The door is secured at night with caribeener betwen the latch and the eye-hole hook. It is quite heavy so its unlikely predators could get in anyhow. The gap at the top of the door (blocked from view in this photo) is covered with screwed down 1/4 inch hardware cloth for further rodent exclusion. Nest boxes from inside the coop. Each one is framed in with a scrap piece of T1-11. They are about 11" across and 16-17" deep. 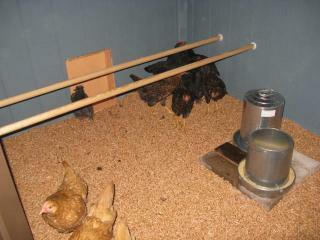 We use pine shavings for nest box bedding and our eggs are usually very clean when retrieved. Flooring for the coop and nest boxes is left over vinyl from a room update. It is held down by glue, crown staples and the baseboard trim (stapled only in the nest boxes). Scrap T1-11 makes for useful baseboard trim. We got our hands on left over interior paint and the blue you see is the resulting color from mixing the paints together. The interior corners are trimmed with the same 5/4 cedar as the outside. 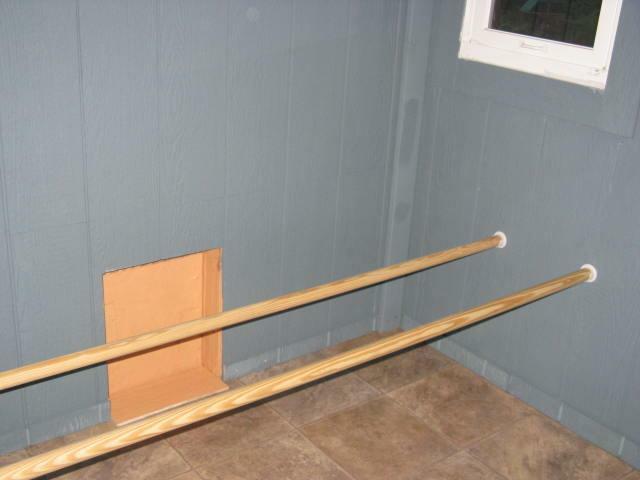 The roosts are 8 ft. long and 1 1/2" diameter pine closet poles cut to fit and secured to the wall with plastic closet fittings screwed into the wall. They are about 18" off the floor and about a foot apart. The door to the run is to the left and secured from the outside with a barrel style lock. Looking up, the solar tube along with the windows are the sources of light. Wind power moves the ventilation vane. The chickens have not flown up into the joists (yet.. keeping fingers crossed). The flock gets their first look at their new digs. It will never look cleaner ever again. They started as chicks in May and had grown up in our house until they moved into temporary housing in July. This view above shows the finished coop project. The coop is isolated from the house so we went with a solar powered electric fence. Our dogs learned on their own the hard way, twice each, and now they go nowhere near it. 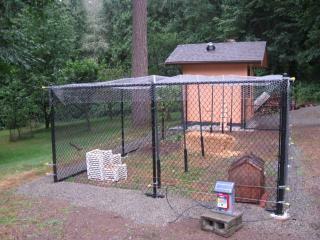 We layed 1" chicken wire on top to keep the flying predators out. The top fencing has survived wind and snow so far. We bought the chain link fencing used off of Craigslist then pieced it together. The ground is relatively hard so we put down gravel and wetted it down in lieu of concrete or below ground fencing to keep out digging predators. 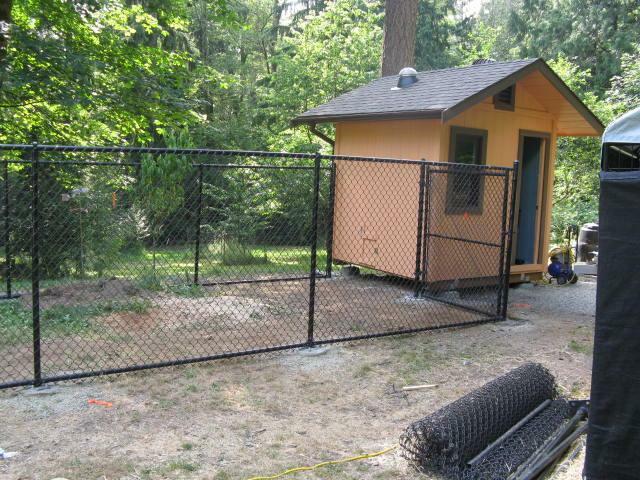 The photo below is before the chicken wire and electric fencing was put over and around the chain link fence run. The solar tube is on the south facing roof. We access the run through the gate next to the window. The skirt of the coop is protected by 1/4 inch hardware cloth (not shown here) screwed to the foundation and buried in gravel. Chickens can't get underneath and neither can predators (and to date) rodents. The gaps betwen the coop and chain link fencing are covered by 1" chicken wire. We got our first eggs during the 1st week of October, about 2 months after completing the coop. This is a sample of what our flock gives us. 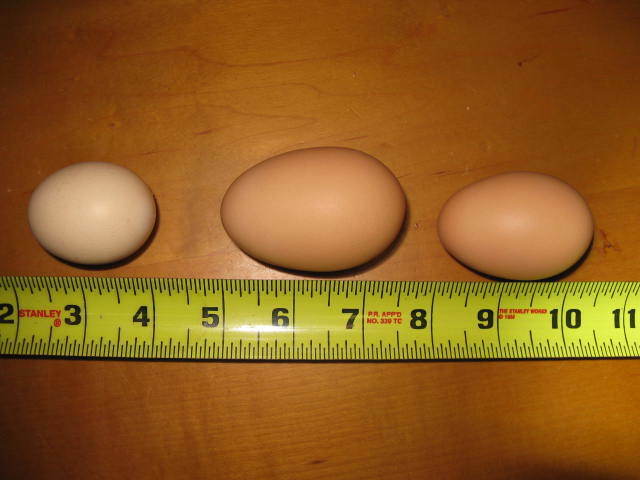 The egg on the left is from a silkie. The other two are from either our Buff Orphingtons or Wyndottes. The extra large egg was a 'double yolker'. The hens have laid 3-4 of those. 1) Buy a prehung man door. 2) Get our windows with screens already attached. Thank you for your wonderful descriptions and photos. We just started coop 2, a larger more owner-friendly coop for some new babies, and your information will come in handy since your coop design and ours (we think) are very similar. Thank you so much!